Can Atom 2.0 get into smartphones? The next major version of Intel's Atom is expected to debut early next year. It's part of the 'Pine Trail' platform, the chip giant's offering for netbooks, which typically use Atom N-series CPUs. But it's not the only Atom upgrade due next year. Six months or so later, Intel will release 'Moorestown', its new platform for mobile internet devices (MIDs) - kit that is currently based on the Atom Z series of processors. Intel hasn't said much about Pine Trail beyond its integration of CPU, memory controller and graphics core into a single chip. You can read about Pine Trail in our Whizz for Atomms feature here. More has been said about Moorestown, especially at the recent Intel Developer Forum. While netbooks are likely to be far more readily available in 2010 than MIDs, Moorestown is more intriguing than Pine Trail because it marks Intel's first realistic attempt to enter the smartphone arena and because it incorporates some interesting technology to not only boost performance but also to radically reduce power consumption. Given their common origins - both contain the same, 'Bonnell' processor core design, for example - Pine Trail and Moorestown may well share these performance-per-Watt traits, so Intel may be revealing more about Pine Trail than it's letting on. Like Pine Trail, Moorestown comprises two chips, though in fact there's a third piece to this puzzle. 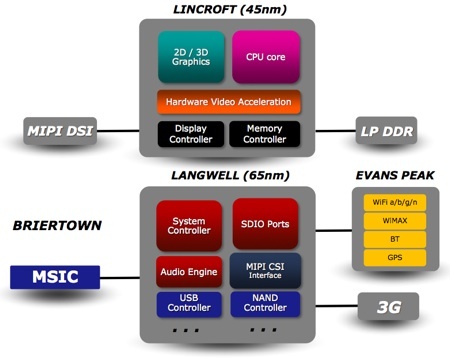 The well-known ones are 'Lincroft', the CPU+ component, and 'Langwell', the I/O chip. But there's also 'Briertown', which is a much more basic slice of silicon but no less important to achieving the platform's goals. Intel wants Moorestown to deliver a significant reduction in power consumption - read 'big improvement in battery life' - without compromising performance. The space taken up by the chips and connecting circuitry has to be smaller than previous MID platforms, specifically the current one, 'Menlow' - an Atom Z CPU combined with the UL11L, US15L or US15W chipset - too.